Welcome to Hispana Vision located at 86 Park Street in the Parkville area of Hartford, CT. You have found the vision center that exists to meet your current and future vision care needs. Our facility provides the very best in eye care for all our community members, families, students, professionals, and individuals alike. Getting the correct prescription for your eyeglasses or contact lenses is an extremely important part of good eye care. But seeing clearly is not the only consideration when it comes to your overall eye health and care. Scheduling regular eye exams with your optometrist, whether or not you wear eyeglasses or have vision problems, is a vital part of your health care concerns. Meeting with your chosen specialist for eye care regularly will address ocular issues well before they become serious. So even if you currently have sharp and excellent vision, contact us – Hispana Vision – to schedule your eye examination. 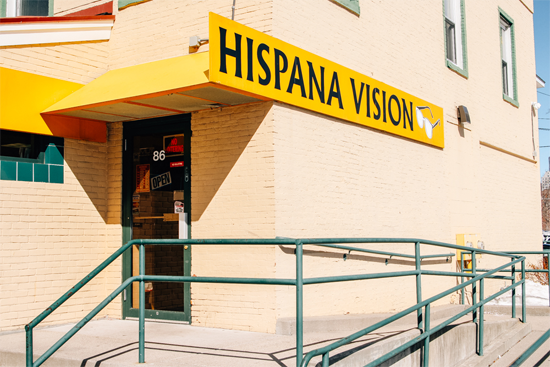 Hispana Vision has been serving this community for over 20 years, beginning in 1993, and opening this location in 1999. Mr. Angel K. Sierra, a licensed optician and the President of Hispana Vision, LLC provides you with a state-of-the-art facility here at 86 Park St., Hartford, CT serving the community of Parkville and surrounding areas. His goal and mission remains to provide early preventive treatment of glaucoma and other ocular diseases. With a full staff of employees, including Dr. Martin Mass and Dr. Barbara Dune, you can be assured of personal and compassionate treatment and examinations for all your vision needs. Whether you need a routine eye examination, an eyeglasses fitting or treatment for eye disease (such as glaucoma), our optometrists will provide you with the best care, advice, options and follow-up. Your eye care and vision health are our concern and we want to work with you as a team to provide the best solutions for you. Be sure to visit the other pages here on this website to learn more about our services, meet our staff and doctors, and visit our eyewear pages to view the wide variety of designer frames and accessories available from our location.